The advancement in IT and communication in recent years has been a modern phenomenon. It has led to exciting innovations which make working and socialising more effective, and faster than ever. However, with these advancements, comes a great threat. Cybercrime is said to have become more lucrative than the drugs trade, and the problem it poses will continue to grow. 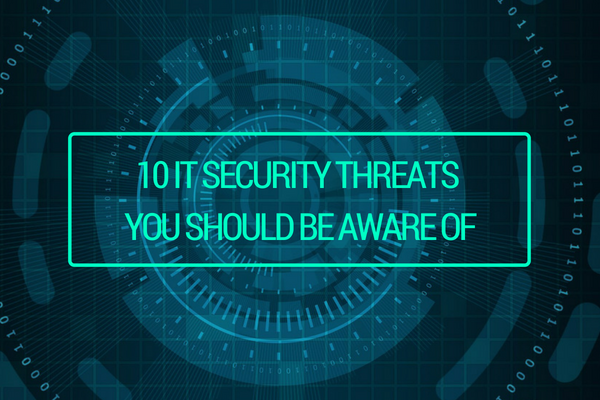 Below we list 10 potential IT security threats you could face and how you can do your best to combat against them. Short for “malicious software”. Malware is an umbrella term used to refer to hostile or intrusive software which can take the form of executable code, scripts, active content and other software. Designed to gain access to and damage a computer without the knowledge of the owner. It is best avoided by having an updated firewall and by not visiting suspicious websites or clicking on dodgy emails and links. This is a type of malware that replicates itself by modifying other computer programs and inserting its own code. This is how affected areas become “infected” by the virus. These viruses cause billions of dollars’ worth of economic damage each year through system failure, wasting resources, data corruption and maintenance costs. The best way to fight viruses is through anti-virus software. This term is story of the wooden horse that used to help the Greek troops invade the city of Troy by stealth. A Trojan Horse (in the technological sense), hides in a seemingly harmless program and will try to trick you into installing it. Instead of infecting other files, the Trojan will survive by going unnoticed and collect your information or set up holes in your security. Trojans use social engineering to trick you, appearing as a free app download which may be of interest to you or a free download of a song by your favourite artist. The best way to fight a Trojan Horse is by having updated security software and being very careful of what you download. Remember that dodgy email you received that had a lot of spelling mistakes? Asking for your bank account details to transfer 40 million Nigerian dollars? That was phishing. They attempt to get sensitive information including usernames, passwords and credit card details, often for malicious reasons, by disguising as a trustworthy entity through emails and other means of electronic communication. Phishing emails can also contain links to websites that are infected by malware. It is another example of social engineering used to deceive internet users. The best way to fight it is by not even opening an email that may come from a suspicious source. Worms are like viruses. They will replicate themselves to spread to other computers, often using a computer network to spread itself, relying on security failures in a computer to access it. Worms almost always cause harm to a network by consuming bandwidth. This is where they differ from Viruses which will corrupt or damage files on a targeted computer. The best way to combat computer worms are by installing anti-virus or anti-spyware software and having a competent firewall. All software should be regularly updated. Also known as “Internet Activism”. Hacktivists use computer and computer networks to promote a political agenda. They are often related to free speech, human rights, or freedom of information. Hacktivist groups such as Anonymous shouldn’t be a huge issue to you unless you work for a political or public organisation. You can have all the IT Security knowledge in the world, every piece of software protection available. All it takes is for one user to compromise the network by clicking on the wrong email, link or visit the wrong website. The best way to fight this is to make sure everyone’s cyber security knowledge is up to a reasonable level and keeping all security software up-to-date. With more innovation comes more threats you need to be aware of. Anything connected to a network has the capability of being hacked, whether that be delivery drones or electric cars. With more technological innovations will come more opportunities for hackers and cyber criminals so make sure you are protecting your business when bringing in new technology. This is an attack where the attacker secretly relays and possibly alters the communication between two parties, who believe they are communicating with each other. The attacker controls the entire conversation. The best ways to combat against MitM Attacks are authentication. They provide a degree of guarantee that a message has come from the expected source and tamper detection which shows evidence that a message may have been altered. This type of malicious software blocks access to the victim’s data or threatens to publish or delete that data unless paid a ransom. Money is almost always the goal behind a ransomware attack, with the victim forced to pay for the removal of the ransomware. A notable example of a ransomware attack came in May 2017 when the British National Health Service (NHS) had to cancel appointments and operations in at least 16 hospitals. If you’re interested in protecting your organisation and colleagues from these types of threats, Fidelity eLearning offers a range of accredited and recognised cyber security certifications starting from just £50 RRP. Click here to view our range of cyber security courses, or email elearning@fidelity-group.co.uk to speak to one of course experts!